By chance, years ago I watched part of a programme on History Channel about vampires in which anthropologist Giuseppe Maiello from the Charles University, Univerzita Karlova, in Prague was interviewed about vampires. I recall contacting Maiello who responded that he had himself not seen that interview. At the same time I learned about the book he had written on vampires, Vampyrismus v kulturních dĕjinách Evropy, which had been published in 2004, and got hold of it to see what a Czech researcher would include in a book on this subject. 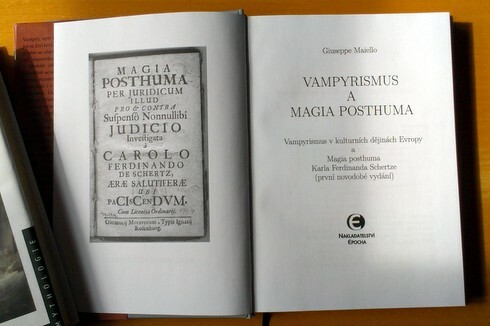 Now Maiello has published a new edition of the book, this time titled Vampyrismus & Magia posthuma, and the new title indicates the major addition that has been made in this edition: A Czech translation of Karl Ferdinand von Schertz’s Magia Posthuma has been added to the sources at the end of the book! The new edition also includes a foreword mentioning some of the work that has been published since the first edition, as well as summaries in English, French and Italian that can be helpful to those of us who are not proficient in the Czech language. Furthermore, a number of illustrations have been added, in particular of some key persons, including one of Schertz, which is unfortunately not of the best quality. 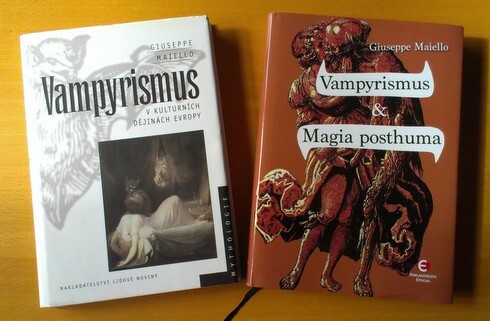 According to the English summary, 'Vampyrismus a Magia posthuma [Vampirism and Magia posthuma] is an updated version of Vampyrismus v kulturních dějinách Evropy [Vampirism in the cultural history of Europe], which had first appeared in bookstores back in 2005. The book describes the phenomenon of Vampirism from an etymological, cultural-historical, ethnographic and anthropological point of view. 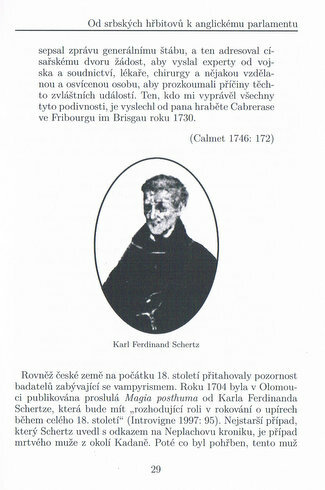 Up until now, the sources of the book were found primarily in the libraries of the Czech Republic. For this reason the book includes both classic examples from the literature of Western countries, transmitted through the intermediation of Abbot Augustine Calmet, as well as examples taken from the ethnographic literature of Central and Eastern European countries and the Balkans; lesser known or completely unknown to wider audiences and to western European and northern American specialists. The second part of the book deals with the main theories on the origins of vampirism through the comparison between different cultures, and across temporal space, from classical antiquity up to the late nineteenth century. These theories concentrate on three areas: universal theories of the origins and prehistory of vampirism; theories (less probable) that derive vampirism by social and cultural changes that took place in modern Europe; and theories related to the analysis of agrarian cults and their struggles for the fertility of the fields. 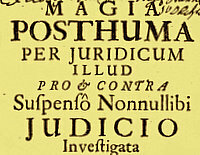 The paper briefly deals with Schertz's life and works, and discusses his approach to magia posthuma, which in Maiello's view make Schertz more of a rationalist than a man of the Baroque period. Maiello actually finds that the rationalistic approach of Schertz is comparable to that of Calmet. Cf. what I have myself written in Vampirismus und magia posthuma im Diskurs der Habsburgermonarchie edited by Augustynowiz and Reber (or as part of Kakanien Revisited). I thank Giuseppe Maiello for providing me with a copy of his book. He informs me that the publisheres are considering publishing an edition in English. I hope they publish English version. This book sounds fascinating. Jeg har med stor interesse læst din blog i nogen tid nu, og jeg kan se, at der er et væld af publikationer om gengangere og vampyrer, som det kan være lettere vanskeligt at navigere rundt i.
Jeg vil derfor høre, om du kan anbefale en titel eller tre, der giver det klareste billede af, hvor moderne vampyr-forskning står henne - og med forskning mener jeg studiet af vampyrens kulturhistorie i 1700-1800-tallet, ikke den literære historie, men forestillinger og folklore om vampyrer, og hvorledes forestillingen om gengangere udvikler sig til forestillingen om vampyrer. @mortengreis: Jeg vil foreslå, at du kigger på nogle af de nyere titler på især tysk, som jeg nævner i denne liste: My favourite vampire books.